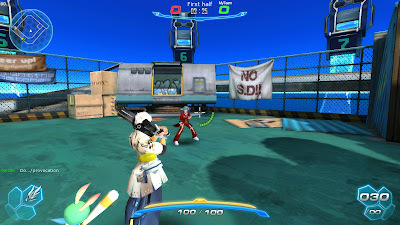 S4 League ("Stylish eSper Shooting Sports") is an anime-styled third-person shooter initially developed by Pentavision (a Korean developer) which merged with GameOn Studios, and hosted by Alaplaya for the European/North American version of the game. 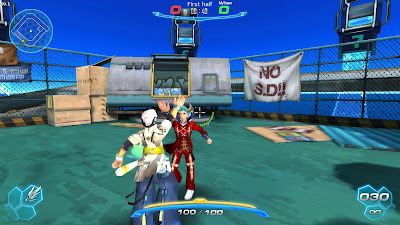 A significant portion of this game, from its music selection to a few billboards and a few clothes, is practically an advertisement for DJ Max, a series of rhythm games also created by Pentavision. This game does have a short backstory, though. You are playing in a virtual-reality battlefield initially created for use by the military but somehow turned around to be an awesome arcade diversion for teenagers. When you start the game you create a character and then get whisked off to a short tutorial. Make sure to stop by the shop to get some weapons before entering a room, and you are ready to go. But before you do, read the rest of this review first. The unique, fast-paced gameplay is where S4 League truly shines. 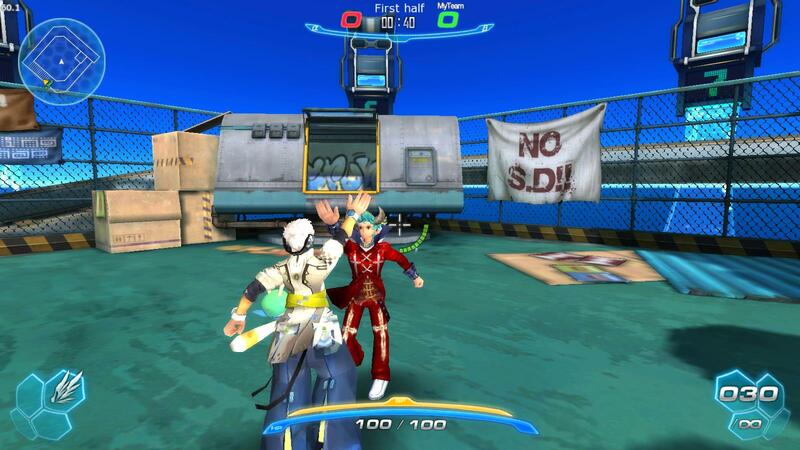 Fighting is heavily skill-based, with lots of emphasis on dodging and using your environment to your advantage. To aid you in this, you have the ability to jump off of walls (walljump) and a special dodge. Doing these allows you to both move faster and get out of the way of danger, at the cost of using SP (the yellow bar). With creative use of the walljump and dodge mechanics, you can get to places you normally would never be able to reach. This mix of rushing and shooting combined with the ability to die easily makes battles hectic. At the same time, it also makes winning these battles make you feel very awesome. S4 League features seven game modes spread out around 40 maps: Team Deathmatch, Battle Royale, Captain, Chaser, Siege, Arcade, and Touchdown. They can all be fun modes to play, but the most popular mode is Touchdown mode (TD). This is the most competitive mode played by most of the more serious S4 League players. 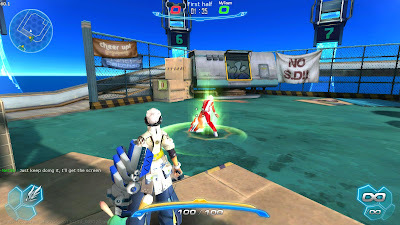 In this mode, your objective is to take the ball (the "fumbi") in the middle of the map and put it into the enemy team's goal. 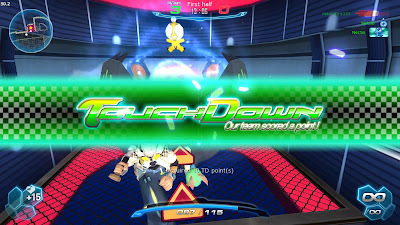 The only way to drop the ball is to die, and holding the ball automatically drains your SP bar, which encourages team cooperation. Get the ball into the goal, and get a short fanfare and a point for your team. Who's that man? Who's that man? What makes this mode fun is the map design. There are gates of electricity in several spots on the map in two colors. Blue means you can walk through it, red means you instantly die if you try. No matter what, though, if you are holding the ball, it is reset to the middle of the map when it touches a gate. 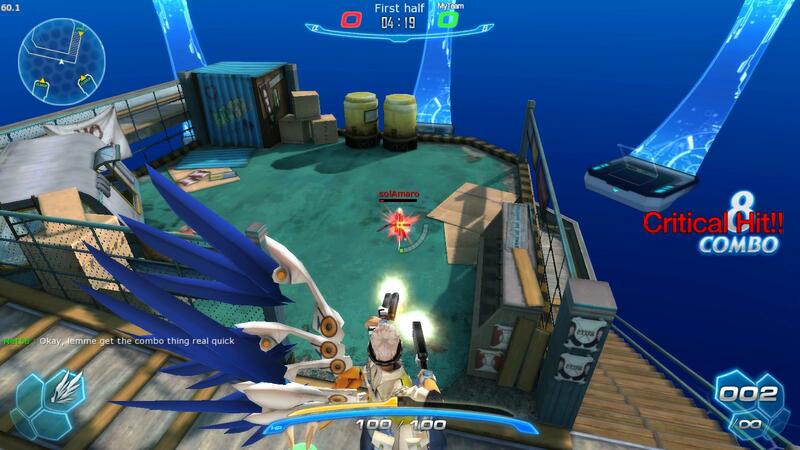 There will often be either a gate or a wall at the quickest access points to the enemy team's goal, so you must use creative and quick thinking to get to the goal without either getting shot down, or accidentally resetting the ball. It can all get pretty addictive if you get really into it, as you work on perfecting the fastest ways into the goal on each map. Your character is truly your own, and it is very easy to stand out from the crowd. There is such a wide clothes selection, you will virtually never see anyone wearing the same clothes as you. When you go into a match, you can carry 1 special skill and up to 3 weapons. Choosing from any of the 30 weapons and 10 skills available, you can stick with your own build choice and define your own role on the battlefield. To aid in this, you also have three character slots (unlocked through leveling up) that you can switch between once per match, at halftime. This lets you go to a better build if your set just wasn't working out in the first half. Just make sure not to get too distracted by FUMBI DANCE and forget to switch. The announcer in S4 League is very memorable. Accompanied by the music, the visuals, and the normal sound effects, it all comes together to become an experience you aren't likely to witness anywhere else. When you make that difficult kill and the announcer pipes up with "Amazing! Is it possible?! ", it can be quite an ego booster. A fan's recording of most of the announcer's clips can be found here, if you want to hear them. This game makes no effort to be realistic, just fun. Each and every one of the 30 weapons in S4 has its own use and place. None of them are simple copies, upgrades, or palette swaps of other weapons. You can get your basic SMG, a huge HMG, a sniper's Railgun, healing Mind Energy, an electrifying Plasma Sword, an imposing Counter Sword, and the list goes on. We even got a sword that turns you into a super saiyan. What now? You just do not see many games take the time to have fun, even with their weapon selections. S4 League has a serious pay-to-win problem. The cash currency, AP, can be used to directly buy power which gives a very serious edge over any player that does not do the same. This is somewhat heartbreaking, as it adds an unfair element to an otherwise skill-heavy game. And AP can go pretty far. 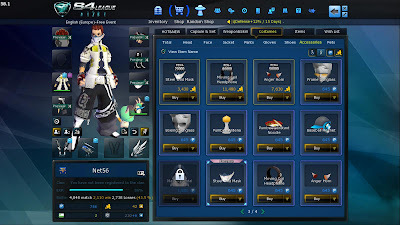 First off, most of the clothes in the shop can't be worn without cash, and everything bought with cash has a significant stat buff over the normal version of that item, which also goes for weapons. The community of S4 does several things that annoy me, personally. First off, there's the incessant creation of sword rooms. When you make a room, you have the option to change the weapons people have access to. Many people love to use swords (me included), and will make a sword room so they can just clash without bullets in the face ruining their fun. The problem comes when 80% of the rooms are just that. Then there's hackers. S4 League has struggled with hackers for a very long time and they just never seem to really go away. Last but not least, there are whiners. Using certain weapons (such as the Counter Sword or Homing Rifle) tends to set some people off, causing them to complain in the chat for the length of the fight. Earning the in-game currency (PEN) in S4 isn't too bad, the problem is that the things you want have a very slim chance of getting to you. 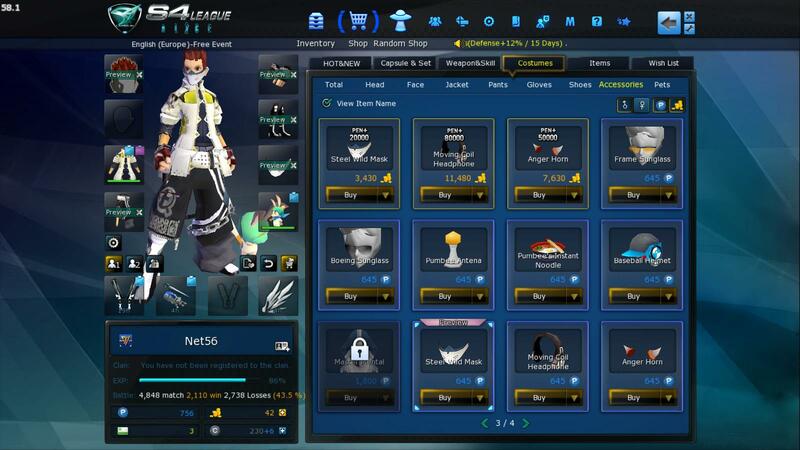 You can spend your PEN on normal items from the shop, but the fact is that wearing normal equipment simply doesn't help you as much as it should. If you want to get any serious power using PEN, you have to sink it into the Fumbi roulette or I-Capsules. Both have a chance of giving you permanent equipment with near-AP stats. The keyword there is "chance". Which is less than 1%. What this means is that, with enough time, you can conceivably get good clothes and weapons for free. This also means that if you're a new player, you have a much higher chance of getting stomped by anyone who is a higher level than you are since they have had more time to get better stuff. There are 5 rank groups in S4. Rookie, Amateur, Semi-Pro, Pro, and S4. My motto is "'Pro' is synonymous with 'AP'". Even if they aren't using actual cash, they probably have a near-equivalent, and it frequently imbalances the game. 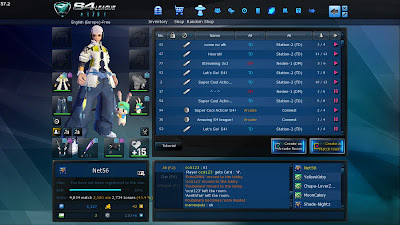 This also directly counters the ability to switch between multiple characters since different characters on the same account can not share the same equipment. It can be very difficult to make enough PEN to fully and consistently outfit multiple characters since nothing normally bought in the shop is permanent. While I talked about weapons in a previous section, notice I never described them as balanced. Certain weapons are simply better than others. For example, the Smash Rifle, Spy Dagger, and Counter Sword are the three best weapons in the game with little to no contest (and I am very prepared to argue this point with anyone who disagrees). This is not to say that the other weapons in the game are useless. They aren't. The point here is that some weapons have too much power or usability in comparison to others. This stacks with the pay-to-win aspect to further imbalance the game. S4 is one of the most unique and fun shooters on the internet. It brings something new to the table and if you haven't already played it, at least give it a try. Its biggest problem is the gigantic blemish of the pay-to-win system. If that wasn't there, this game would be one of the greatest shooters I've ever played. You can take an AK-47 and shoot a guy in a desert anywhere. But how many games are there where a revolver is a shotgun? Where I can use giant baseball bat as a weapon? Where I can dunk a little scuba midget into a neon green goalpost and have people congratulate me for it? Not many. 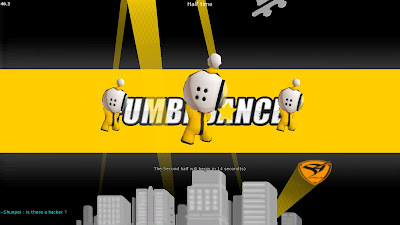 This game could have been so much more. 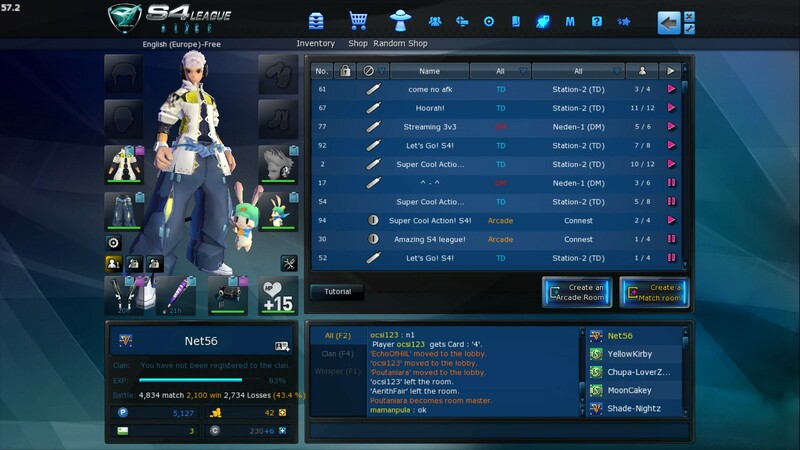 - You can create or join a clan starting at level 5. - There is a list of short, weekly tasks to supplement your PEN income. - There is a kick system to boot out those pesky hackers. - Rooms hold up to 16 players. - Male and female have separate dodge animations and weapon stances. - Use the Enchant system to buff your stuff. Just make sure not to waste all your PEN on it. - You get 6 coins per day. Coins are used to revive in Arcade mode, and for small buffs in the other modes. - Emotes are cool! Check them out in the options to see which ones are available. - There is a lot of air control. Take advantage of it. - About half the guns have infinite ammo. Just make sure to keep track of your clip size, so you don't reload at the wrong time. - Combos don't mean mean anything, but they look cool. - There are various advanced techniques to be used. Look them up if you want to get good. Bravo. as a person who started playing in 2009, this is the most accurate description available.